The Bajaj V15 is a different take on your average commuter bike. The neo-classic design works in many ways to help the bike stand out from the crowd. Other details like a vertically stacked headlight cluster, a tall stance and some more, lend this bike a premium appeal. However, the folks at Ornithopter Moto Design have transformed this humble commuter to suit 3 different applications, that of an ambulance, a cement mixer and a fire truck. In its ambulance avatar. 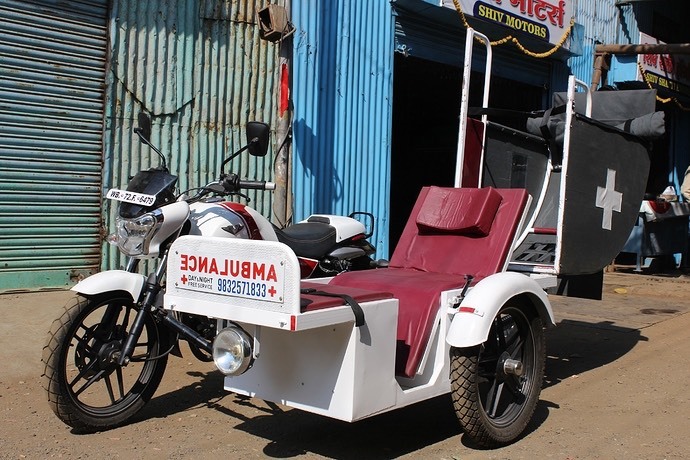 the Bajaj V15 can carry a patient with a side cart attached to the vehicle. 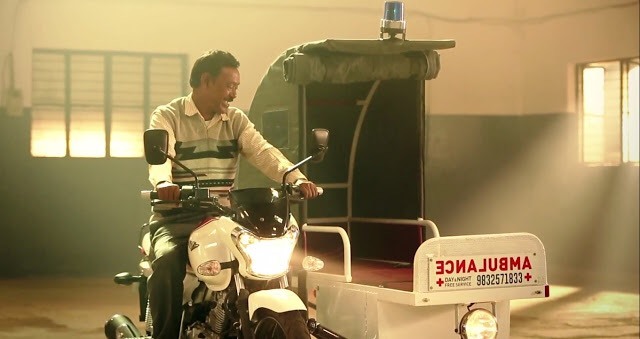 The project was undertaken for Bajaj Auto themselves, who offered this bike to a man in Siliguri, affectionately known as ‘Ambulance Dada’. The passenger bed comes with a cloth cover as well, protecting the occupant from the elements. Below is a picture of this ambulance. Coming to the cement mixer, the rear pillion seat gets a small drum, which mixes the raw materials together, filling up potholes. The bike has some pannier storage, which can hold some cement and water. The owner of this bike is a man from Mumbai, who fills up potholes on the streets of Mumbai on his own and for free, after losing his son in an unfortunate accident caused by a pothole. Last but indeed, not least, below is an image of the fire Engine. 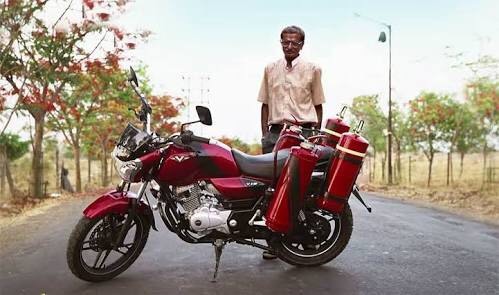 With enough storage for four large fire extinguishers, this bike can go to remote locations as well, taking care of a fire emergency that could have occurred. This bike is used by a social firefighter, who is always ready to help. 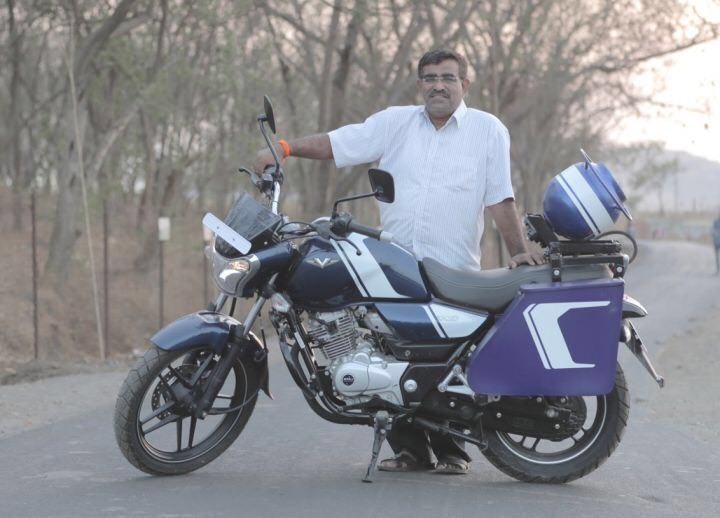 The Bajaj V15 packs a 149.5cc, single cylinder, four-stroke, SOHC 2 valve, Air cooled, DTS-i engine with a maximum power of 12bhp @7500 rpm and maximum torque of 13NM @5500rpm. Not only an abundance of power but this engine also offers an ARAI claimed fuel efficiency of 57 kmpl. The bike’s application for these social causes only amplifies its appeal as a true patriot, where it even carries some metal from a decommissioned aircraft carrier.